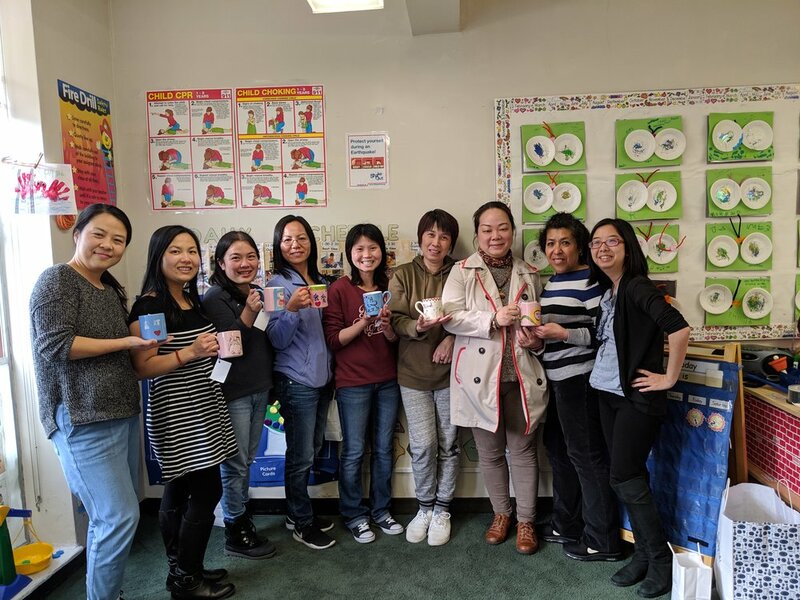 Wu Yee Children’s Services held a training event for teachers and managers from centers in Chinatown, North Beach, and the Outer Mission/Ingleside Neighborhoods that focused on staff wellness. The wellness activity reflected on staff’s everyday activities that support Wu Yee’s mission. Held at the Google Community Space, teachers and managers attended workshops by First 5 of San Francisco, Wu Yee’s Education Team, and painted ceramic mugs as a wellness activity. First 5’s workshop focused on the joy of literacy. Teachers read preschool and toddler age appropriate books and discussed the culturally appropriate content. Next, Shelly Ehret and Suellen Liang of Wu Yee’s Education Team, led a DRPD (Desired Results Developmental Profile) training. DRPD is an early assessment tool developed by the California Department of Education for young children and their families to be used to inform instruction and program development. Jenny Yu, Regional Manger, worked with Color Me Mine of Daly City to facilitate the ceramic mug painting wellness activity. The teachers and managers noted similarities to facilitating activities in the classroom, saying they now understand how it feels when they ask children to clean up and they say they are "not done" painting yet. Additionally, Color Me Mine of Daly City is donating 20% of the profits on Friday, April 19th from 6:00 pm - 9:00 pm. In order for Wu Yee to get a donation, you must show the flyer below at the door. On Friday, April 12th, Wu Yee children, parents, teachers, and staff, joined California State Senator Scott Wiener, California State Assemblymember Phil Ting, San Francisco Board of Supervisors President Norman Yee, and countess other advocates for Early Care and Education (ECE) to rally for an increase in state-wide ECE funding. The rally, held in front of the California State Building in San Francisco, asked state leaders to move forward toward fully funding the true cost of quality care in ECE programs from birth to preschool, and across child care centers and family child care homes. The rally, and following Walk Around the Block, highlighted Week of the Young Child, an annual celebration spotlighting early learning, young children, their teachers, families, and communities. The rally concluded with children, parents, teachers , staff, and advocates walking around the block to show solidarity with ECE educators and staff and demonstrate support for an increase in state-wide ECE funding. Michelle Chen Kuo and Christopher Kuo of Two Piano Journey practicing piano. Christopher Kuo and his mother, Michelle Chen Kuo, are Two Piano Journey, a piano duo on a mission to make the world a better place. Chris recently joined Wu Yee Children’s Services’ Board of Directors and we are so lucky to gain his fundraising and organizing expertise. Two Piano Journey is hosting a benefit recital at The Green Room at the San Francisco War Memorial & Performing Arts Center on April 13th at 7:00 pm. Purchase tickets here. I was able to ask Chris and Michelle some questions about growing up in a musical family, having strong role models, and how their lives have been shaped by those factors. Since you have been on this "Two Piano Journey” for approximately three years, performing with your mom and helping organizations, what have you learned about what makes an organization successful and thrive? Every organization that has succeeded has forged its own path. The common threads we've identified are that the organizations that do scale add an unbelievable amount of value to their communities with the resources they have, are growth minded, and filled with passionate employees and volunteers who care deeply about the cause they serve every day. I was drawn to Wu Yee for these exact reasons. Now that you have gotten to know Wu Yee better and become our newest Board Member, how has your perspective changed? What is your main focus for Wu Yee? 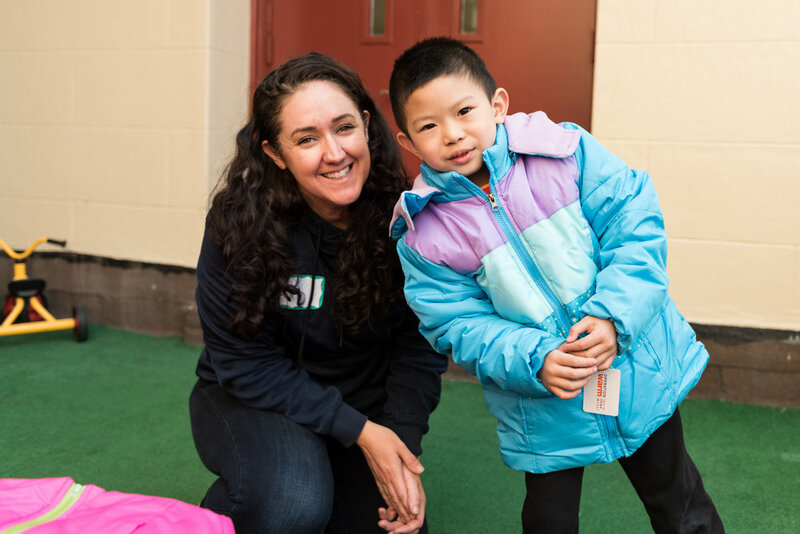 To me, serving on Wu Yee's board has been an immense opportunity for me to learn the inner workings of a large nonprofit organization serving thousands of families. The decisions being made in the boardroom impact families working towards the best possible future for their children. I am honored to share in that responsibility. My main focus for Wu Yee is the Wu Yee Ambassadors. Our Board Members have developed a volunteer program that has potential for long lasting impact for the families Wu Yee serves. This program will do much to support our children while shining a spotlight on Wu Yee within the diverse, corporate community in the Bay Area. How did growing up in a musical family with strong role models influence you? I am grateful to my parents for my upbringing. There is a certain joy that is unlike any other to be woken up in the mornings by beautiful music. I'd hear my mom playing the piano and my dad rehearsing on his trumpet. Ever since I was a young boy, my parents taught me the value of serving my community. We performed my first benefit concert when I was in elementary school and every year after that. In the end, I am simply living a life filled with music and service and it hasn't changed since my childhood. Do you have a favorite memory growing up? What other activities did your family participate in? I remember so vividly the first time I touched a piano. My mom played a duet with me as I played the middle C for four whole notes. I was immediately enraptured. 20+ years later, playing the piano with my mom is one greatest joys of my life. We love to travel - we have shared so many memories together. Our favorite destination to date is Hawaii - nothing beats that perfect sunny weather! In working with many outstanding partner organizations, what are some similarities you have noticed? What qualities make an institution successful? It's been such a joy to tour with my son for the last three years! Whenever we meet with the team members of our most successful partners, we feel their passion. That passion is deeply woven through the fabric and culture of the organization - everyone cares so much about supporting their community, everyone is willing to work so hard. This journey has made me believe in miracles. Our biggest joy is watching our partner organizations partner along with us. We've seen first hand what a small group of extremely passionate, talented, and hard working people can do to change the world. Our partners inspire us, and we are grateful to be a part of their journey. How do you think your family was unique from others, as your children grew up? We definitely are a musical family! We all grew up around instruments as a way of life, and we wanted to share the joy of music with our children. Teaching my sons piano was always one of my happiest memories. What were your hopes for your children growing up? Believe it or not, I never raised my children to be musicians. I wanted to shield them from the hardship that comes with a career in music. I think like every parent, I wanted my children to be happy, successful, and smiling. t makes me happy to watch them grow into the adults they are. As a parent, how do you relate to our Wu Yee families? What inspires you about Wu Yee? All parents dream and sacrifice so that their children to have endless opportunities to have a happy life. What inspires me about Wu Yee is that the organization works to provide immigrant families the opportunity to make that dream come true. My husband and I came to this country with empty pockets, and through music, we were able to find our footing and build our careers. We were lucky - it isn't a straightforward journey for everyone, and I feel completely privileged to be able to support this organization through our concert. As in previous years, the Pop-Up Playground was a volunteer opportunity for University of Southern California's (USC) Bay Area Asian Pacific Alumni Association for the USC Alumni Day of SCervice, an annual, international volunteer day. Children were given free-range to use their imaginations, and get creative with cardboard boxes, paint, pool noodles, art supplies and other items as families and volunteers took a back seat to the children’s exploration. A pop-up playground is designed to encourage children to take calculated risks in order to learn resilience and problem-solving skills. The kids were free to build their own structures, tear them down, and play without many boundaries. Families, Wu Yee staff, and volunteers were present to oversee and facilitate the play without interfering. Many thanks to our community partners, B*Magic, Five Keys Schools and Programs, San Francisco Public Utilities Comission, San Francisco Office of Early Care and Education, City College of San Francisco, Renaissance Parents of Success, Young Community Developers, Inc. - Black to the Future, The City and County of San Francisco, and Hunters Point Family. 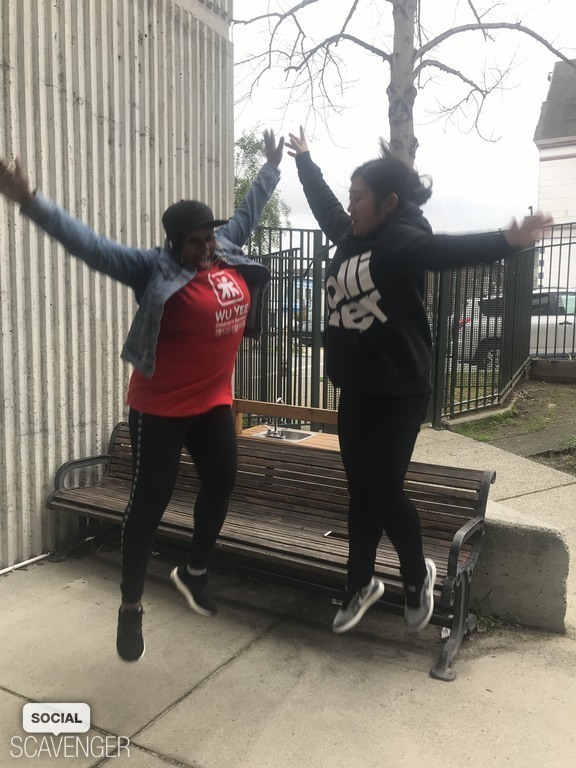 Wu Yee’s teachers and managers from centers in the Bayview, Hunters Point, and Visitacion Valley Neighborhoods participated in a scavenger hunt as part of their wellness retreat. 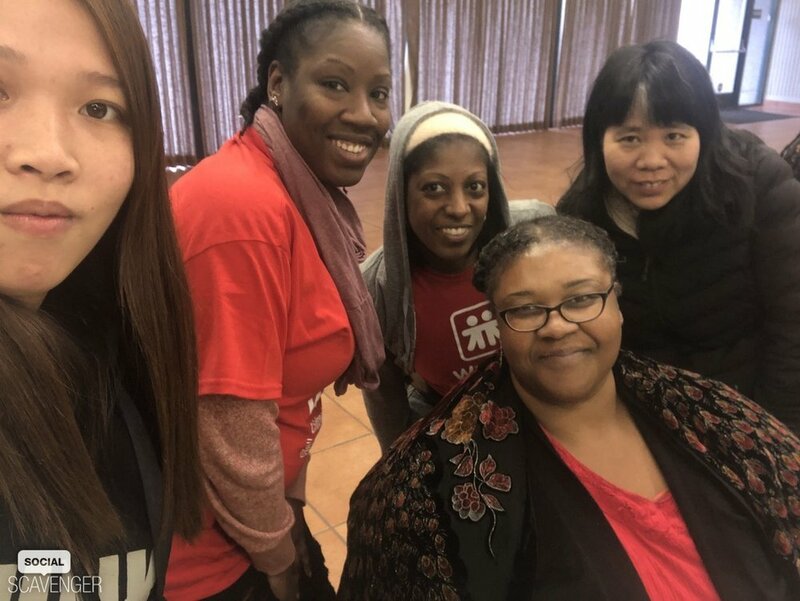 Wu Yee Children’s Services held a training event for teachers and managers from centers in the Bayview, Hunters Point, and Visitacion Valley Neighborhoods, that focused on staff wellness. Held at the Southeast Community Facility, the training included a scavenger hunt focused on team building and self-reflection on staff’s everyday activities that support Wu Yee’s mission. The event began with a training on early childhood literacy and phonic awareness with a presenter from First 5. Next, teachers and mangers participated in a DRPD (Desired Results Developmental Profile) training with Education Manger, Shelly Ehret. DRPD is an early assessment tool developed by the California Department of Education for young children and their families to be used to inform instruction and program development. After the scavenger hunt, Lakeshore Learning presented materials on literacy and each teacher received a thank you bag. The event concluded with a raffle of classroom supplies. Wu Yee’s Westside Child Development Center is located within Westside Courts, one of the oldest public housing developments in San Francisco, and the only one at the time reserved exclusively for African-American residents. Starting in October 2016, a comprehensive rehabilitation of the six-building Westside Courts is completed and received praise from Mayor London Breed. “Having grown up in the Western Addition, I could not be prouder to see the residents of Westside Courts finally have new, renovated homes,” she said. First built in 1943, Westside Courts celebrated its reopening following extensive renovations. All 136 apartments have been modernized with new kitchens, bathrooms, flooring, paint, energy-efficient windows, energy-efficient lighting, and new heating systems. The renovation allowed for landscaping, painting, and provided for new community spaces, management offices, social services offices, a computer lab, two laundry rooms, picnic areas, and a community garden. As part of Westside Court’s rehabilitation, Wu Yee’s Westside Child Development Center received energy-efficient windows, window security, and a new kitchen. Wu Yee is in the process of providing new floors, paint, lighting, and a new playground. While their playground is being renovated, Wu Yee kids have been walking to the nearby Raymond Kimball Playground. 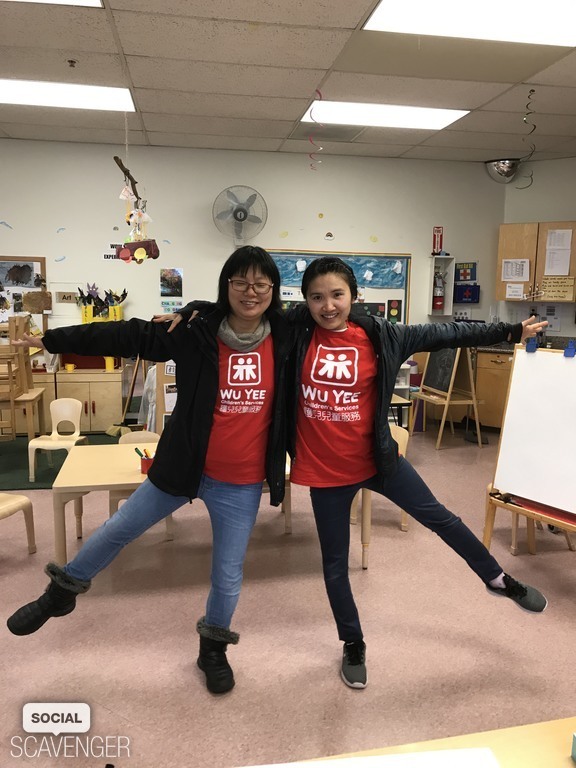 Wu Yee’s Westside Child Development Center has 36 spots reserved for Head Start eligible childcare and is proud to be part of the community of Westside Courts and the Western Addition neighborhood of San Francisco. On Saturday, February 9th, the Bayview YMCA together with Community Youth Center of San Francisco and Chinatown Community Development Center presented the Ninth Annual Joint Black History Month and Lunar New Year Celebration. Children, adults, and families enjoyed performances by Lion Dance Me, the Voice of Life Choir from Olivet Baptist Church, Chinese Folk Dance by Vis Valley Performance Group, and a traditional libation ceremony by Toni Battle, and others. San Francisco District 10 Supervisor, Shamann Walton, and San Francisco Assessor-Recorder, Carmen Chu both spoke at the event praising San Francisco’s African American and Asian communities for celebrating each other’s cultures in a peaceful and inclusive way. The event concluded in a toy and grocery bag give away and a raffle with prizes sponsored by SFMTA. February 5th marks the start of the Year of the Earth Pig, the last sign of the twelve-year cycle of the Chinese Zodiac. We send happy wishes for a successful new year to all of our children, families, educators, and supporters. Much like the celebration of the New Year in the Western world, Chinese New Year is all about the hopeful spirit of renewal. The holiday’s traditions, symbols and rituals are all meant to wipe the slate clean and prepare for prosperity, good luck and happiness in the new year. Simply put, every Chinese New Year is a new beginning. Today, Chinese New Year is celebrated with fireworks and family dinners by more than a billion people around the world. Each step of the way is an opportunity to create family memories, teach elements of Chinese culture and have fun. Chinese New Year is the most highly anticipated Chinese holiday of the year for good reason — it’s a time of high spirits, bustling energy and many happy reunions. A Chinese red envelope (known as lai see in Cantonese and hong bao in Mandarin) is simply an ornate red pocket of paper the size of an index card. They’re commonly decorated with beautiful Chinese calligraphy and symbols conveying good luck and prosperity on the recipient. Though they’re unquestionably a symbol associated with Chinese New Year, red envelopes are also given for weddings, birthdays and other special occasions. When exchanging red envelopes, it is the relationship that counts most. Red envelopes are a way to bring your nearest and dearest closer to you during the most important time of the year. Welcome the new year (and wake your neighbors) by lighting firecrackers at midnight and opening all of your windows and doors. You’ll send off the old year, scare off evil spirits and welcome good luck into your home. At the stroke of midnight, the new year’s zodiac animal enters, takes its throne and bestows and renewed sense of hope. New Year’s Day is generally a quiet affair. People emerge quietly from their homes, dressed in new clothes and acting on their best behavior. No one works, cooks or cleans and foul language, negativity and unlucky words are avoided at all costs. Give red envelopes, eat leftovers, greet neighbors with messages of good luck and remember that New Year’s Day sets the tone for the rest of the year. The San Francisco Child Care Planning & Advisory Council (CPAC) and ECE community implore you to write your SF District Supervisor and Mayor to advocate for $30 million needed in funding for ECE in San Francisco. Your voice is critical to ensuring that District Supervisors and Mayor London Breed hear from ECE community. Please don’t delay, act today! Write an email to your District Supervisor (where you live or work in SF) and Mayor London Breed (sample letters found below, feel free to add your personal flare). Bring your letter to City Hall and meet with Supervisors! Be present at an upcoming meeting (get creative, one voice can be present to speak for many). Speak out at the Budget & Finance Committee meeting, 10 am Wednesday, Feb. 6, at City Hall. SF residents and workforce members.. ECE is important to everyone! San Francisco’s children can’t wait. Last June Proposition C for ECE passed bringing much needed resources to continue building a stable early care & education system — but will be on pause until the legal suit is settled. A stable workforce keeps classrooms open, and maximizes current resources to deliver the best and most care. Without teachers, classrooms can stand empty and reduce existing capacity, and teachers who have mastered skills and education move on. What an opportunity to take advantage of the ERAF windfall and infuse $30M to support educators now — before we loose them. San Francisco’s children can’t wait. Last June Proposition C for ECE passed bringing much needed resources to continue building a stable early care & education system —but will be on pause until the legal suit is settled. A stable workforce keeps classrooms open, and maximizes current resources to deliver the best and most care. Without teachers, classrooms can stand empty and reduce existing capacity, and teachers who have mastered skills and education move on. What an opportunity to take advantage of the ERAF windfall and infuse $30M to support educators now — before we loose them. On Friday, January 25, 2019, Early Care Educators of San Francisco (ECESF), formerly the San Francisco Child Care Providers’ Association (SFCCPA) held a luncheon, lecture, and panel discussion on the most important issues facing the Early Care and Education (ECE) community today. A 3% median wage increase since 2015 for Child Care Workers and Preschool Teachers. 25% of all California children are part of low-income families. 58% of Child Care Worker families’ participate in one or more public income support programs. An issue that is important to both CSCCE’s report and the panel speakers is the need for ECE teachers to gain salary parity with Elementary school teachers. “We need to address the real-life needs of the people doing the work”, said Austin. She stressed in academic reports and surveys on education, early childhood education is rarely considered or included in the paper. “How can we bring a skilled and stable workforce to the most developing minds, if ECE is so often overlooked”? The San Francisco Mayor’s Office of Housing and Community Development (MOHCD), San Francisco Planning, and the Office of Economic and Workforce Development (OEWD) would like to hear your input on City strategic plans for: housing needs, social service needs, barriers to fair housing, and improving housing affordability. You have the opportunity to be enrolled in two different raffles for completing the full survey! Please note that the survey will be available in other languages (Traditional Chinese, Spanish, Filipino, Vietnamese, Russian and Samoan) in late January. Thank you for your patience. Your input will inform the Planning Department’s Community Stabilization Strategy and Housing Affordability Strategy; MOHCD’s Consolidated Plan, HIV Housing Plan, and the Analysis of Impediments to Fair Housing Choice (www.sfmohcd.org/get-involved); and OEWD’s ongoing work efforts. Please note that if you've missed the forum for your neighborhood, you're certainly welcome to attend any of the others! Food and children activities will be provided. All locations are ADA accessible. For additional accessibility needs or language assistance, please call (415) 701-5598. Every child deserves a healthy start, a loving family and a supportive community. These values of freedom, equality, and love are paralleled by Martin Luther King, Jr. and the civil rights movement. This Martin Luther King Jr. Day, we are reminded of the marches and political unrest that led to laws and policy changes in favor of civil rights and a more equitable America for minorities and people of color. Dr. King didn’t let adversity and sacrifice get in the way of his dream that helped improve the quality of life for countless people. His message and determination paved the way for waves of the women’s, disability, and immigrants’ rights movements, among many others. Due to the gains achieved by Dr. King and the civil rights movement, oppressed people continued organizing and leading civil actions for equality in the workplace, education, and society. This public dissent and cascade of support allowed many people to pursue their self-sufficiency and equality to become better people, educators, and parents. One of Wu Yee Children’s Services’ founders, Miranda Li, emphasized our beginnings: "Wu Yee started off very much as a childcare center and also as an advocacy group, for women and children's rights." Today, Ms. Li’s sentiment is echoed in Wu Yee’s continued advocacy for immigrants, working families, early childhood educators, and children’s rights. Today, we recognize and build upon the valuable and significant work of raising the next generation of leaders and advocates the founders of Wu Yee started. We ask ourselves, how are we furthering Dr. King’s message of inclusivity, equality, and freedom in our daily work? We can address the growing rate of disparity and inequality by teaching our kids and families Dr. King’s message of perseverance and peaceful resistance. Through this, we raise up San Francisco’s most vulnerable children and families and empower our entire community. Thank you to our founders, Catherine Ko, Ruth Yee, Miranda Li, Yan Wong, Siu Yip Wong, Alice Lau, Stella Chan, Karen Chin, and Sai-Ling Chan-Sew and countless others for paving the way for our children. Also, thank you for joining us in the effort to elevate the status of all the dedicated women, caregivers and teachers in our society contributing to the quality early education and development of our precious children. We invite you to stand with us as we seek social and economic justice to achieve our mutual vision for a world of healthy children, strong families, and thriving communities. I'm ready for the change that we can bring when early care and education is regarded as integral to the fabric of our society. Are you? the hashtag #OurChildrenRising, on social media. This month, Wu Yee Children’s Services celebrated the new year at Patio Español restaurant. Staff and their guests were treated to a buffet dinner, a photobooth with props, and raffle prizes. Entertainment included roaming magician, Brian Cassady, who dazzled guests with card tricks and slight of hand, and dancing to the sounds of DJ Mauricio Aviles. Wu Yee’s administrative offices and Chinatown Infant Center are housed in the former location of Patio Español restaurant. Thank you to all the staff at Wu Yee Children’s Services for all your hard work in 2018! Doctors, nurses, and medical assistants from Kaiser’s Geary Pediatrics department made stuffed animals, complete with custom designed t-shirts, as community building project, and then treated Wu Yee kids with a delivery of their hand-made creations. Dr. Irene Wong, a Kaiser pediatrician and Wu Yee’s Board Vice President, and other members of the Geary center team delivered the stuffed animals to the Westside Child Development center, just around the corner from Kaiser’s Geary campus. The kids loved their one of a kind new toys! The Westside Center serves 30 preschoolers and recently moved back into its space after two months in a temporary space while the center was renovated. The Joy Lok Family Resource Center (FRC) had their biggest family holiday celebration ever last weekend at Gordon J. Lau Elementary School. 300 guests watched a circus act by Barrel Full of Monkeys featuring juggling, unicycle, comedy, and umbrella tricks. A surprise pianist helped ring in the holiday season while families sang “Jingle Bells” and “We Wish You a Merry Christmas.” Children enjoyed train rides and made Christmas trees out of construction paper while younger infants & toddlers had a safe environment for floor play and downtime. 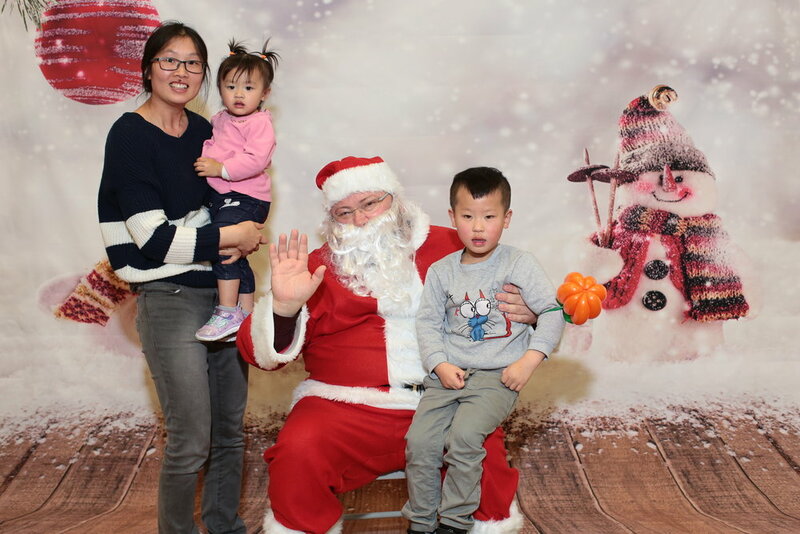 Each family took home a keepsake photo with smiling Santa and snowmen and enjoyed lunch- a Chinese “pig in a blanket” style bun with a banana and a cookie. The buns were from a San Francisco Chinatown vendor; Wu Yee supports local businesses whenever possible. The event was a success, everyone left smiling! In addition to the Joy Lok FRC families, Wu Yee staff and volunteers including many Board members and their friends and families tuned out for for the holiday celebration Gifts for the children were generously donated by AT&T's InspirASIAN group. 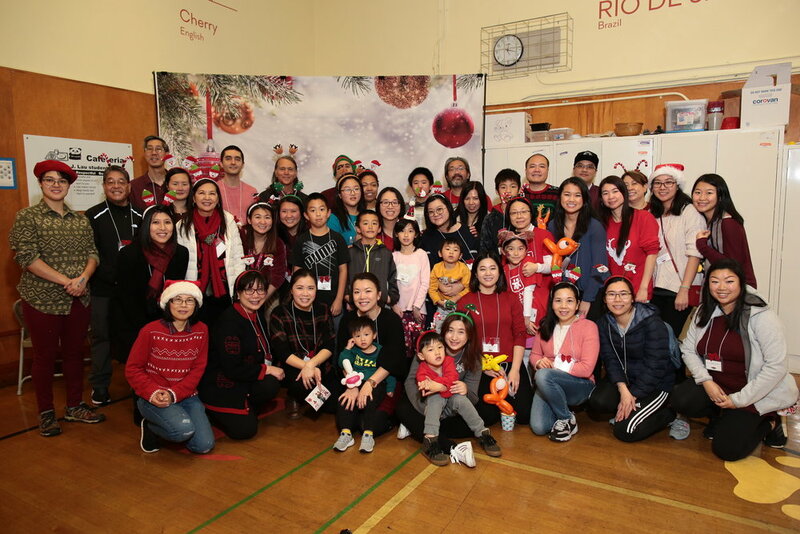 A huge thank you to the Wu Yee staff, volunteers and Board members, and especially to AT&T’s InspirASIAN group, for making the 2018 holiday season memorable for all who attended the Joy Lok FRC’s family holiday celebration! Luis Villavelazquez has been named one of the Bay Area’s most talented pastry chefs by San Francisco magazine and noted as one of San Francisco’s five top pastry chefs by 7x7 magazine. Luis’ love affair with the restaurant industry began at a young age. He grew up around his mother’s workplace, Sally’s restaurant, located in Potrero Hill, where fresh baked pastries were served daily. With experience in both savory and sweet sides of the kitchen, Luis brought inventive flavor combinations and beautiful presentations to the decadent dessert offerings at ChinaLive. Chef Kasem “Pop” Saengsawang opened Farmhouse Kitchen with his wife and business partner, Iing Chatterjee, in 2015. Challenged to create a fun, contemporary food experience merged with the traditions of his childhood, he presents a daring interpretation of Northern Thai food at Farmhouse Kitchen, with locations in San Francisco, Oakland, and Portland. His passion for food can be attributed to his childhood experiences of taking daily trips to the local market with his grandmother in Loei, Thailand. Nigel Jones is a chef, restaurateur and entrepreneur committed to sharing the rich foods of his native Jamaica and the African diaspora, while creating sustainable opportunities for people of color. 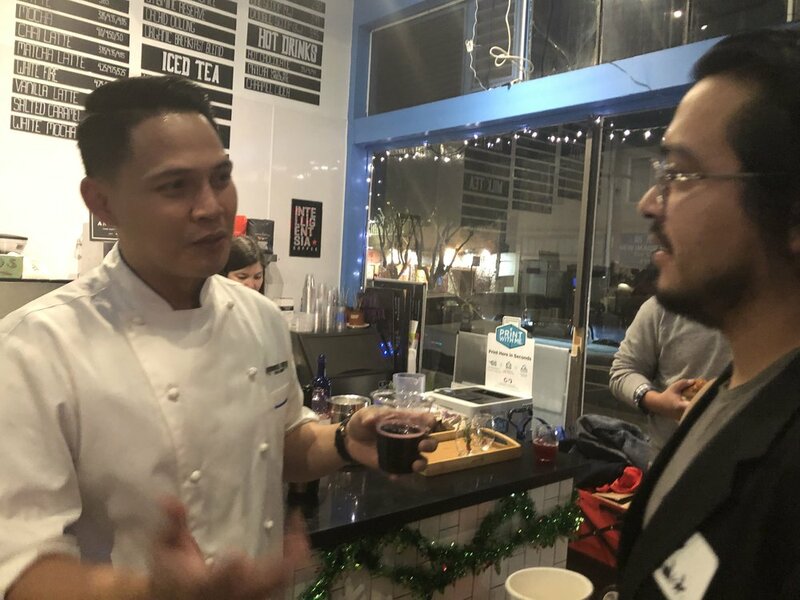 In partnership with Daniel Patterson’s Alta Group, Nigel is the co-owner/executive chef of Kaya, his first restaurant in San Francisco proper. He is also the chef/co-owner and general manager behind Oakland’s beloved Kingston 11, a Jamaican restaurant opened in 2013. Thank you Chefs Luis, Kasem and Nigel for your insights on the many connections between food, family and community. Also, thank you to Enter the Cafe for hosting the event in your amazing space! Wu Yee’s Young Professionals Network (YPN) is a growing team of volunteers that seeks to engage the broader community in Wu Yee’s mission. The YPN engages in a variety of outreach and events, from advocacy for early childhood education to fundraisers and hands-on volunteer activities. Any professionals committed to contributing their time and talents to support Wu Yee are welcome to join us. Please fill out this Volunteer Questionnaire and we will be in touch with future opportunities. Speak up for SF’s kids, families and educators! Wu Yee teacher, Dolores Leon with Wu Yee children at on the steps of SF City Hall during 2018 Walk Around the Block ECE rally. The city of San Francisco has recently received a $415 million windfall and is currently deciding how it is to be spent. San Francisco had over $415M of Educational Revenue Augmentation Fund returned, $181M of which will go to General Funds — with little restriction on how it's spent. We need this funding to go towards making high-quality early care and education available for all San Francisco families and to guarantee all San Francisco teachers and caregivers receive wages that will ensure a well-trained, stable and quality workforce. While June's Prop C for Early Care & Education (ECE) funds are held up in a lawsuit, this funding could be used to start promised program implementation — make sure funding starts flowing to ECE now. Decisions for the use of windfall funds are underway. Send messages (email and letter!) to your SF supervisor today and tomorrow, December 3rd and 4th. Our kids, families, and educators can’t wait! See sample messages below. Thank you for taking action to support SF kids, families, and educators! Please write a letter or email and send as many messages as you can to SF Supervisors by tomorrow, Tuesday, December 4th. Write your own message or use samples below. - Prioritize Child Care & Education in SF windfall spending. - No less than $30M to bridge our wait for June’s Prop C Child Care & Education funding. Download the Word Docs linked below for ready to print letters or cut & paste email messages here. There are not enough early childhood educations programs in San Francisco. Too many parents must choose between leaving the workforce because of early education costs or leaving San Francisco. Expanding child care services must be a priority for the San Francisco windfall funds, and educator compensation has been identified by child care service providers as their top barrier to increasing services. San Francisco voters passed the June ballot measure to increase child care services — don’t keep us waiting. Support a bridge fund for child care services now. It’s great to hear about San Francisco’s windfall because Early Care & Education can’t wait! We have a waiting list of families wanting our services, but can’t expand because we can’t find enough educators. I urge you to help us attract and keep teachers now by securing no less than $30M of windfall funds to increase teacher compensation. Bridge the gap while we wait for Prop C ECE funds. I am a child care educator in San Francisco and provide services to [ ] children and [ ] families. Thanks for recognizing early care & education as a priority! 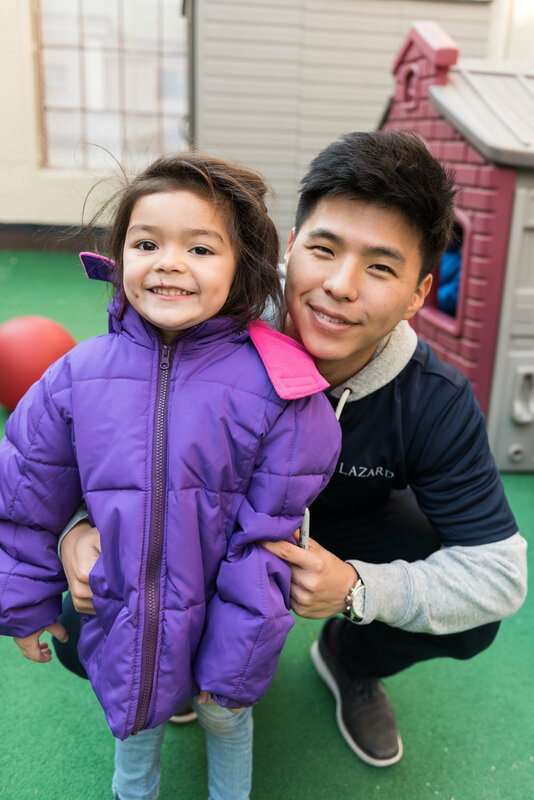 Operation Warm, whose mission is to provide brand-new coats to children in need, partnered with volunteers at Lazard to distribute 60 coats to preschoolers and toddlers from Wu Yee’s Generations, Little Sprouts, and Lok Yuen Child Development Centers. 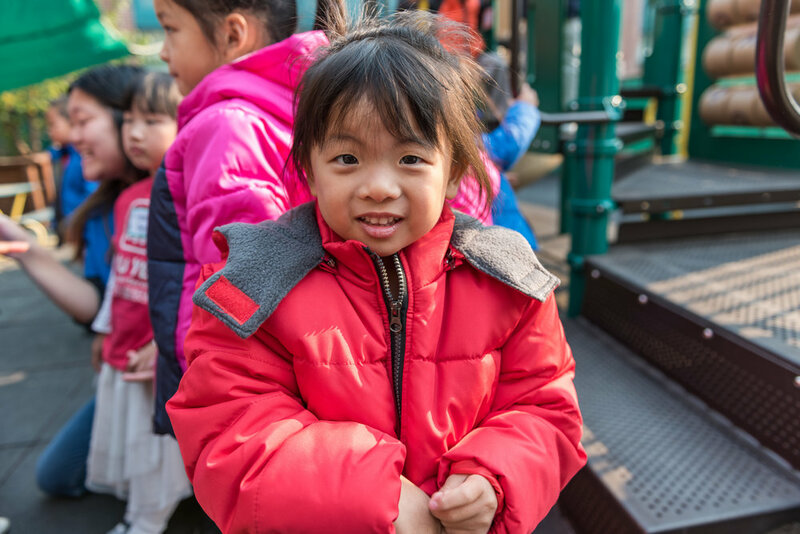 An additional 140 coats will be distributed to children at other Wu Yee Child Development and to our Home-Based program participants. A very special thanks for keeping us warm to Operation Warm and to the volunteers from Lazard!